For the first time, scientists have precisely measured the effective electrical charge of a single molecule in solution. This fundamental insight of an SNSF Professor could also pave the way for future medical diagnostics. Electrical charge is one of the key properties that allows molecules to interact. Life itself depends on this phenomenon: many biological processes involve interactions between molecules like proteins, where their charge plays an essential role. Yet, the charge of a protein in an aqueous environment – its natural context in a living organism – is hard to determine accurately using traditional approaches. 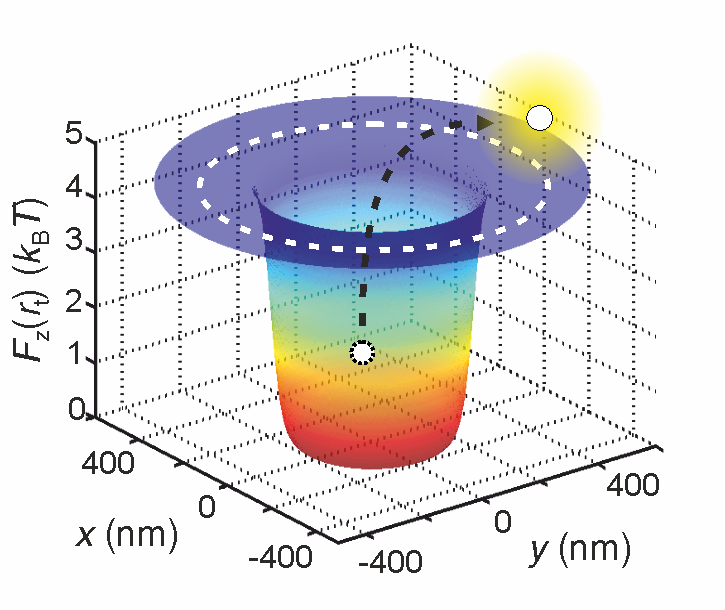 Madhavi Krishnan, who holds an SNSF professorship at the University of Zurich, has developed a method to precisely measure the charge of a single molecule in solution. Her advance was described in a series of articles in Nature Nanotechnology, Physical Review E and the Journal of Chemical Physics. This discovery could pave the way to new diagnostic tools since, at a chemical level, many diseases are linked to a shift in a protein’s electrical charge, which prevents the molecule from acting the way it should. A molecule’s electrical charge can be quite different in the gas phase and in solution. The reason for this difference lies in complex interactions between the object and the surrounding liquid. Hence, standard gas-phase measurements do not directly yield information on the molecule’s behaviour in its biological context. Molecules in solution are in constant motion, randomly kicking each other. Krishnan and PhD student Francesca Ruggeri took advantage of this well-known phenomenon, called Brownian motion, in order to measure the effective charge of a molecule directly in solution. First, they trapped the molecule in a „potential well“. Rather than an actual well, this is a situation where the potential energy of the molecule is at its minimum. In such a situation, bouncing water molecules continuously attempt to expel the molecule from the well. The higher the effective charge of the molecule, the greater the depth of the potential well and, consequently, the lower the likelihood that the molecule is ejected from the well. In practice, this means that the time needed for the molecule to be kicked out of the well is directly related to its effective charge. In order to create a potential well, scientists compressed a solution containing the proteins between two glass plates, one of them being covered with microscopic holes. Molecules trapped in potential wells were labelled with fluorescent agents, which allowed them to be tracked with an optical microscope. The SNSF has launched a new funding scheme to support researchers working towards a professorship. SNSF Eccellenza Grants allow tenure-track assistant professors to form a new research team and lead an ambitious scientific project. SNSF Eccellenza Professorial Fellowships cover the salaries of assistant professors as well as their project costs. The new scheme replaces the SNSF professorship grant, which has supported 691 researchers since its launch in 2000. And it has done so with great success: approx. 80% of grantees went on to obtain a professorship at a higher education institution in Switzerland or abroad.